Erratic weather failed to stop Ahmad Fazli Sham’s ability from coming in second fastest in the timed practice session of the PETRONAS AAM Malaysian Cub Prix Championship race in Sepang today. 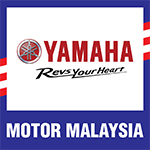 The Yamaha Maju Motor Racing senior rider rode flawlessly in the wet to record his best lap of 1’28.763s, just 0.090 seconds behind Zaqhwan Zaidi who posted the fastest lap at 1’28.673s. Meanwhile Championship leader, Azlan Shah Kamaruzaman registered third best for the day with 1’29.616s. Meanwhile, dry conditions gave CP115 group A riders a slight advantage over their Group B competitors who went through the timed practice session in the rain. Mohd Azhar Abdul Jalil leads the timesheets when he logged 1’22.186s in his fourth lap to successfully hold off second and third fastest riders, Mohd Haiekal Akmal Zakaria and Shariffudin Shamsuddin (CKJ Yamaha Racing) with 1’22.309s and 1’22.511s respectively. Although content with his lead, Azhar believes he got lucky in the CP115 timed practice,”The initial plan was to hit under 1 minute and 21 seconds in the timed practice. I worked hard to get that lap time but unfortunately things did not follow through. At the same time, I feel bad about group B going through the timed practice in the rain. It puts them at a disadvantage,” he said. Separately Wira title favorite Fakhrusy Syakirin Rostam who aced the previous round in Malacca brought his winning momentum to Sepang and clinched the fastest lap time in the age-cap category. The 16-year old’s fastest lap of 1’22.378s smashed the Wira fastest lap record in Sepang (1’24.468s) set by Mohd Syawalludin Mohd Zaki in 2010. Fakhrusy’s only title challenger, Hafiz Nor Azman is showing his determination to stay in the game when he posted the second fastest time of 1’23.178s. 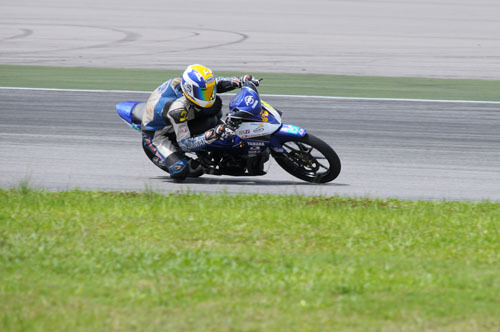 CKJ Yamaha Racing’s Che Ku Amriq Asyraff completed the top three in the Wira class with a time of 1’23.611s.